The community of North Hills Estates, as defined by the map included in this directory, consists of one hundred seventy five acres encompassing five hundred eighteen homes. Using a current deed as a starting point, we researched the chain of title back through an incredible maze of ownership, land divisions, inheritances and sheriff sales, arriving finally to a recorded reference to the original owner of record. On December 12, 1786, a parcel of land (the acreage undisclosed) was conveyed to James Johnston from the Supreme Executive Council of the Commonwealth of Pennsylvania. During the Revolutionary War, in order to induce men to stay in the Pennsylvania Line of the Continental Army and to encourage enlistments, the Assembly promised to donate land to the soldiers. A little later they resolved to issue to the soldiers certificates compensating them for the depreciation of the currency with which they were paid. These certificates were to be taken in payment for land, or were redeemable in gold or silver. Depreciation tables were set up to calculate the adjusted amounts. All of the lands west of the Allegheny and north of the Ohio Rivers were "Indian country" until October 23, 1784, when the "Last Purchase" was made from the Indians at Fort Stanwix, Rome, NY. This purchase was confirmed with the Indians of Ohio at the Treaty of Fort McIntosh, Beaver, PA, on January 2, 1786. The "Last Purchase" lands were designated as Donation Lands north of Butler, PA, and as Depreciation Lands south to the Rivers. Ross Township was wholly within the Depreciation Tract. James Johnston held title to the land until November 1802, when he sold it to Robert Callender for the sum of five shillings. The Robert Callender Estate sold two hundred acres, plus six cents for roads and improvements, as was common in the deeds we researched, to Richard Morrow, November 1805, for the sum of two hundred dollars. We have a map showing the division of Ross Township by parcel ownership in the early 1800s. Most of these tracts were farms and exhibit names, some descriptive and some whimsical. Richard Morrow's parcel of 172 acres appears to be shaped much like our North Hills Estates map and is called "Tonguin." We can find no reference to this word. On this farm map, as well as a second early map, a prominent stream is evident running north to south and is referred to in local histories as both "Girty's Run" and "Keller's Run." It is described as a copious stream with fine fish and roaring water and flowing to Rochester Road, and then off to Scott's grist mill at the junction of Evergreen and Rochester Roads. The cutting away of the hillsides and construction further north is said to have dried up or diverted the flow. Richard Morrow's home was located on Franklin Road, just across from the present Hiland Presbyterian Church property, where the first open air service at this location was held in 1799. A short distance to the north settlers began building homes, which became the village of Perrysville. The Venango Path was at first an Indian path that became a trail utilized by white settlers as one of the thorofares of the forest. It ran along the top of a series of long ridges winding its way north to Fort Venango (Franklin, PA), then on to Presque Isle (Erie, PA). By 1808 it had become Franklin Road, and following Commodore O.H. Perry's victory over the British fleet on Lake Erie in 1813, it was known as Perrysville Plank Road. Morrow's land was divided among family members and sold through the intervening years in ever smaller parcels. Many names on the deeds of record, such as Peebles, Schar, Good, Hilands, Heim and Reel, are familiar as some of Perryville's pioneering families. 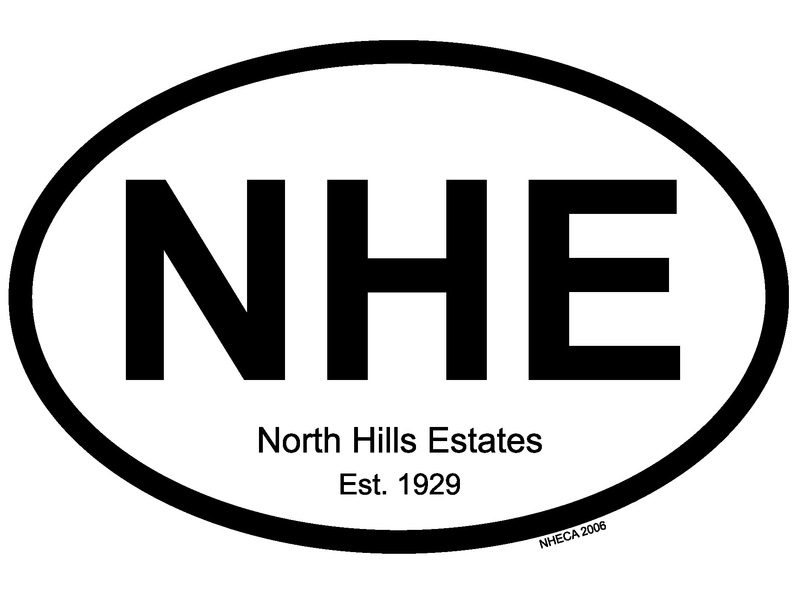 The first development plan by North Hills Estates, Inc. was submitted in 1929, for which the North Hills Improvement Company laid out the properties. Plan #1 covered Harden Drive and the lots along Perry Highway, up to 900 Perry Highway. Then in 1930, the same company filed North Hills Estates Plan #2, covering the remaining parts of Perry Highway and Harden Drive, and included everything south of a line running west to east from 829 Washington Drive to 821 Jefferson Drive. This Plan #2 was inclusive of Monroe Drive, Monroe Circles, East and West, Thompson Drive, Madison Circles, East and West, Madison Drive, Jackson Circle, Van Buren Circle, Washington and Jefferson Drives. Most of the property in these two plans was purchased from Clement Kress and the Jacob Jenny Family. The Jenny family farmhouse sat off Perry Highway near the current junction of Harden and Thompson Drives. A hill on the farm was eliminated and the fill used to cross the valley to the back of the property. Some of the Jennys are current residents of North Hills Estates. Building was sporadic in the 1930s and early 1940s with individuals choosing lots here and there and contracting with builders for custom homes. Hay was tall on the unsold lots and farmers were hired to bring their rigs for mowing. At that time, the center of Madison Circle was a hill called "the knob" by residents who cleared it to create a ball field. With the housing shortage after World War II, building increased at a faster pace. Virginia Terrace was built in the mid 1930s and Woodland Terrace soon after. William L. Heid developed the remaining northern section of North Hills Estates and built a majority of the homes. Northdale Plans #1 (1946) and #2 (1950) added Sylvania Drive, Oakside Lane, where the Heids then resided, and Jefferson Drive up to 912. Northdale Plans #3 (1951) and #4 (1955) filled in Jefferson Drive and added Wood Drive. Northdale Plan #5 (1959) extended Schar's Lane to Sylvania Drive. Northdale Plans #7 (1961) and #8 (1964) added Heidcrest Drive, Provan Place and extended Washington Drive. Much of this land is what remained of the Petsch farm of which the original farmhouse and barn have been renovated into homes. A farmhouse also sat near Jefferson Drive on the future Country Lane which was added in the mid 1950s and originally did not open to Laurel Gardens. Wellington Woods was developed in 1986. We are fortunate to have two ravines with tall trees and natural vegetation. The ravine behind Jefferson Drive is private property the length of Country Lane. The lots between these two streets meet at the bottom. The ravine to the south of Thompson Drive, between Harden and Washington Drives, is township property and is commonly referred to as the " bird sanctuary. The obvious uniqueness of North Hills Estates lies in the imaginative overall plan, attractive well-built homes of varying designs and mature landscapes. There is a high degree of pride of ownership in our community reflected in the well tended properties. A rich mix of residents of all ages in various stages of life makes for an active community: there are singles, couples, families with babies and teenagers, empty nesters and people who have lived here all their lives. This is "home," and, in addition to the physical beauty that surrounds us, the immeasurable value of living here is evident in the friendliness and helpfulness of our neighbors who stroll by during the evening, smile and say "Hello." We have made every effort to be accurate.